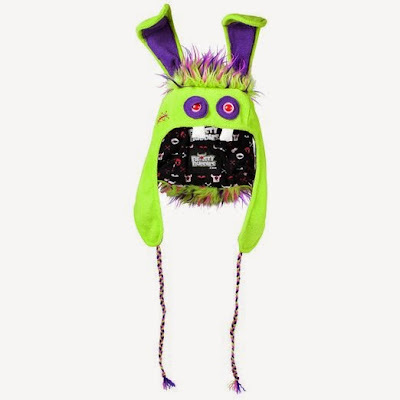 Each monster hat is made of soft fleece, and sports a pair of felt fangs. Bumblezor sort of looks like a bat. This hat is also sold on Amazon. Bombix looks a little grumpy, like maybe he has a little monster hangover! It's also for sale on Amazon. This Beasty Buddy is called Jasper. He's also sold via Amazon. This one is called Zeppelin. Since I love teal, this one is my favorite. You can also purchase it on Amazon. "Eddie" is some sort of zombie bunny.